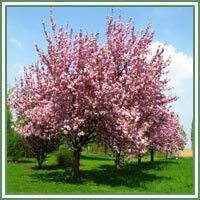 Habitat: Wild Cherry is native to Europe, northwest Africa, north America and western Asia. Description: It is a deciduous tree growing to 15-32 m tall, with a trunk up to 1.5 m diameter. The leaves are alternate, simple ovoid-acute, 7-14 cm long and 4-7 cm broad. The flowers are produced in early spring at the same time as the new leaves, borne in corymbs of two to six together, each flower pendent on a 2-5 cm peduncle, 2.5-3.5 cm diameter, with five pure white petals, yellowish stamens, and a superior ovary; they are hermaphroditic, and pollinated by bees. The fruit is a drupe 1-2 cm in diameter (larger in some cultivated selections), bright red to dark purple when mature in mid summer, edible, variably sweet to somewhat astringent and bitter to eat fresh; it contains a single hard-shelled stone 8-12 mm long, 7-10 mm wide and 6-8 mm thick, grooved along the flattest edge; the seed (kernel) inside the stone is 6-8 mm long. Parts used: Bark of root, trunk and branches. Useful components:.Wild Cherry contains prunasin (a cyanogenic glycoside that yields hydrocyanic acid), benzaldehyde, eudesmic acid, coumarins, and tannins. 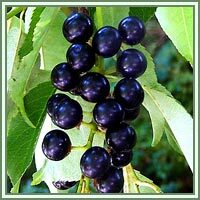 Medicinal use: The roots and the bark of Wild Cherry are a blood tonic, astringent, sedative, tonic and appetite stimulant, and has agents that relieve disorders of the chest and lungs, as an expectorant. Wild Cherry has been used medicinally by many native peoples. The inner bark bark of the limbs, trunk and root are all very useful and contain the same medicinal properties, although the root is always better. Wild Cherry is mostly noted for its use in respiratory problems. It has a soothing and sedative effect on the nervous system. It is in this way that it has its influence on the heart. In digestive disorders its use is very noticeable. It helps the flow of gastric juices. This is very helpful in conditions of dyspepsia. In respiratory affections wild cherry soothes the cough and at the same time gives tone and strength to the system. Externally, the bark can be placed in water for a few days in part sun and then used with advantage for pink eye and other infections of the eye. Safety: All parts of the Wild Cherry except for the ripe fruit are slightly toxic. It is advisable to consult your doctor before consumption of any herb.